It can be hard to keep track of your life. Life can get busy, and things can be forgotten. That is why you should invest in a calendar. Start your New Year’s off on the right track with a 2017 calendar. 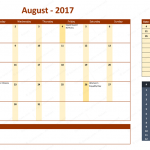 Download a 2017 calendar template to create a calendar that fits both your personal and professional needs. With your own calendar that adapts to you, you will never miss a forgotten dentist appointment. That invitation you received two months ago may be misplaced, but you have it marked in your calendar. Do you have an important meeting with your boss or potential customers? Mark it on the schedule. Get a calendar that can help you stay on top of things. People wear different hats. You may be a young professional one moment, a child who takes care of their ill parent the next moment, and a loving spouse with a husband and kids. Whether you are a busy mom who has to keep up with your schedule and your family’s schedule or a young college student ready to take over the world after graduation in May, you need a calendar made for you. Your schedule is not generic so why should your calendar be. This 2017 calendar template has a crisp and straightforward design that you can adapt to fit you. You can change the colors of the month to your favorite. You can add all the important birthdays if you want. The calendar has a special place for holidays and observations. 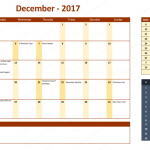 If you celebrate a holiday that is not on mainstream calendars, you can place it on your calendar by using a calendar template. You can place the big events of your life in the little boxes that represent the days of the week. If you have any special notes or comments such as make sure you order that gift for your mom’s birthday, you can add it at the bottom. The special notes section can be used to show progress as well. If you are a professional who needs to finish a report by March, you can add your goals to the January and February calendars’ special notes section and mark your progress. The comment section is about what your needs are for that month, and you are not limited by space. The box can increase in size. The 2017 calendar template gives each month its own sheet. 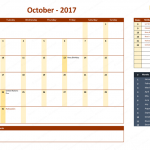 You can navigate through the months using the navigation table. Sometimes, you cannot make plans without a calendar handy. 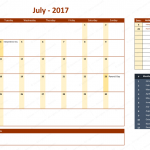 A 2017 calendar template gives you easy access to your schedule. If you are ready to schedule your life, you should download a 2017 calendar template today. Life does not have to be as challenging when you have a calendar to help guide you.